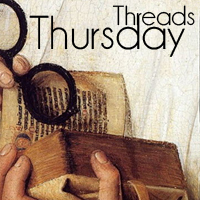 Historical Tapestry: Thursday Threads - What Do You Want to Read? Thursday Threads - What Do You Want to Read? I am writing this post on Wednesday UK time, so for some of the globe it is already Thursday, so I am sure I am forgiven for posting a wee bit early! I have just read a review of a book which is perhaps not in the strictest sense a historical fiction book, but one that perhaps tells a story of times, not really that long ago. What book do you feel that you just have to read?